This product requires the base game Star Story: The Horizon Escape. 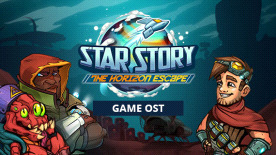 This is the official 'Star Story: The Horizon Escape' game OST. The original soundtrack performed by EvilCoGames Studio and by IK-music. What is Star Story: The Horizon Escape? The archaeological research mission faced some unexpected difficulties. Your spaceship crashed. Can you escape from this planet? But how? No one can help you. You are here all alone. Or not? Do you have a plan? Will you find what it takes to be a hero? Star Story: The Horizon Escape is a turn-based adventure game with text-rpg elements. Tune into the story of the aspiring space-archaeologist Van Klik on his mission to the mysterious planet of Horizon! The core classic. Dive into the stories and find a way to exploit EVERY possible situation. Your choices define the story. Totally. A mix of dialogues, choices, turn-based battles, puzzles, crafting and technology researches. Everything is turn-based. No time-limit for making decisions, no quick-time events, no rush: you decide on the speed you want to play. Need A break? The Horizon Is Waiting!